Tragedy after tragedy, our politicians offer us their thoughts and prayers, how nice of them. It seems like almost every week here in America and abroad that we suffer some kind of tragedy. A shooting, a bomb attack, a high-rise fire, and countless events have taken so many innocent unknowing lives. In the face of adversity, we look to our leaders, those whom we elect with the power to change things, and we ask them to guide us to the path forward. Not only that, but we expect them to do something about it. We expect them to use this power to make it so that whatever tragedy took place can never happen again, or at least put forth effort in an attempt to prevent it. That would be the most logical consequence of an event in which people are killed in cold blood right? Well you'd be wrong, well at least in America that is. Rep. Billy Long is a supporter of the NRA, continuing to donate money to them following this shooting, but at least he has the victims in his thoughts. Sen. Ron Johnson just donated $7,450 to the NRA in 2016 (http://www.opensecrets.org/orgs/recips.php?id=D000...), but at least he's praying for California right? Here are some tweets following the massacre in the Pulse nightclub in Orlando this past summer. Marco Rubio voted NO on a bill to ban high-capacity magazines holding over 10 bullets, donated the maximum $9,900 in 2016 to the NRA, and wants to protect gun shows. He says making new gun laws is "ineffective" in preventing gun violence. So Rubio generously gave his prayers instead. Paul Ryan also donated to the NRA in 2016 to the tune of $5,950. He has also voted YES on a bill that prohibits the suing of gun makers and seller for gun misuse, YES on decreasing the gun waiting period, and co-sponsored bills that banned gun registration and trigger locks in Washington DC, and has an "A" rating from the NRA. But at least he's praying for the victims in Orlando, because he certainly wouldn't do anything else to help them. Ah yes, Donald Trump. At least all the other tweets shown above have some sense of respect. 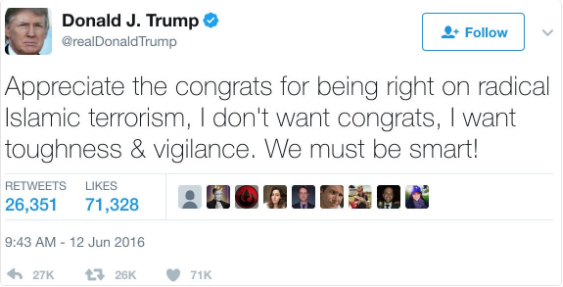 Meanwhile, Trump insists on using this tragedy in which 50 people were shot dead, to congratulate himself, also calling for someone to be smart (something Trump is not familiar with). Trump has gone on record saying gun ownership makes the US safer, all gun violence is a result of mental health issues, gun-free zones are "target practice for sickos," there should be no limits on guns, and straight up "I am against gun control." President Trump has done little when it comes to gun control or showing any ounce of compassion toward anyone but himself, but at least he agrees we should be smart. So as you can see, like always, politicians are all talk and no action. All of these people above pretend to care when mass shootings occur, yet they don't care enough to do anything about it. They may say "we need to have an open, honest discussion about guns in America" but they never have and never will do that. The truth is they don't care about the lives of you and me at all unless it's election season. All they care about is protecting their positions and making sure the other party doesn't gain an inch on any issue. So if they don't care about us, what would happen when one of their own came under attack? Steve Scalise was shot and critically wounded by a shooter while practicing for the congressional baseball game. Now I do feel bad for Scalise and I do hope he makes it, but suddenly the tables have turned. The gun has literally been pointed at the men and women who have been sending their thoughts and prayers to the victims of so many shootings before. With the bullets on their front doorstep, perhaps they would finally think to do something? Immediately Rep. Chris Collins blamed the shooting on the left with their "Anti-Trump" rhetoric, as if to justify the tragedy. Our lovely President said "We are strongest when we are unified and we work together for the common good" yet has done absolutely nothing to indicate he cares at all about working together with anyone that is a Democrat or doesn't like him in the slightest sense. Paul Ryan and Nancy Pelosi both gave speeches calling for "unity," but we all know the both of them do not agree on anything and they never will and no one in Congress is going to give an inch for the other person. And so we'll see if Congress or the President will actually achieve anything at all in light of the most recent attack. But if the past is anything to go off of, I doubt we'll see anything more than bombastic talk with no true intentions behind it. So they'll keep giving their thoughts and prayers and keep pretending to care. But the truth is they're not going to do anything, and we are on our own in this respect. It's a result of the heated cutthroat political climate we live in, and perhaps our two-party system is so systemically flawed that we were always doomed to end up like this. The way I see it, nothing will ever change until Congress takes the first step, and I don't see that ever happening. This was made shortly after the Pulse Club shooting in Orlando, and once you play it I think you will understand its message. If you don't, my thoughts and prayers are with you.